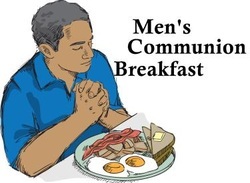 Men's Communion Breakfast will take place on Sunday, March 13th at 7am in the Fellowship Hall. The speaker will be Tom Albrecht -- one of our own, who will be discussing religious challenges in the military today. There is a sign-up sheet for helpers in the Husted Fellowship Hall.